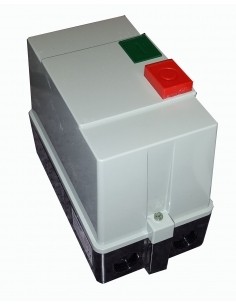 Direct on line starters with contactor in box for electric motors. In this section you can find various contactor boxes with the function of start - stop, suitable for mounting on contactors. The intensity of these boxes or direct starters ranges between approximately 9A and 18A. Most of our boxes include space for thermal relay, in addition to colored buttons that distinguish the various actions, using the green color for the start-up and the red color for the option to stop and / or rearm. This type of direct starters are designed for installation in motors and electrical machines. Do not hesitate, and enjoy the exceptional quality of our electrical equipment at a very competitive price.